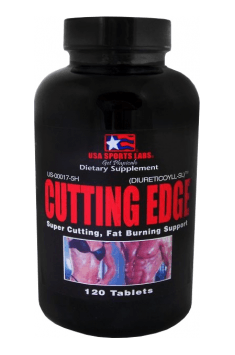 USA Sport Labs Cutting Edge is a multi-ingridient supplement that allows for permanent and safe reduction of body fat. The preparation is based on natural ingredients, is free from substances of controversy, does not contain stimulants. It works mildly, without affecting the blood pressure and body temperature. The product will be a great choice for beginners who need the gentle but effective support on their way to a perfect figure. It also works well for people who want to give their body a final touch and for this purpose must get rid of the underlying subcutaneous water. The best results are combined with physical exercise, hence it is extremely popular among the athletes. L-Carnitine is a natural substance similar to a vitamin. In the body, it helps in transporting fatty acids, especially long-chain ones, to the cell mitochondria. There they are oxidized and used to generate high-energy ATP molecules. Thanks to such action, the efficiency of systemic metabolic changes increases, the body's ability to burn fat rises, and the resources of muscle glycogen run out more slowly. Studies show that carnitine works best when combined with the intense exercise. What is more, it not only accelerates the rate of fat loss, but also positively affects the exercise capacity and increases endurance. Green tea is a source of EGCG (epigallocatechin gallate), a compound with exceptionally high weight loss potential. It has assigned thermogenic properties and the ability to inhibit the lipogenesis process. It can also reduce the absorption of carbohydrates and fats provided with food. Lecithin is a substance which belongs to phospholipids. It is promoted primarily as a supportive of the nervous system and strengthening the cognitive functions agent. However, as the research shows, it is also involved in the metabolism of fat in the body, so it can potentially promote the weight loss. Researchers believe that as an emulsifier, lecithin promotes fat breakdown, improves its transport and utilization in the body. Choline is a soluble in water substance similar to the B group vitamins. Its the most important role is the acetylcholine precursor function, on which good memory and mental efficiency depend. Choline can also increase the efficiency of fat burning and prevent to build up the already lost fat tissue. It shows lipotropic properties, it promotes the use of fat by the body before other sources, such as, for example, glucose, which is usually consumed first. Inositol is a so-called vitamin. In the body, it has many important functions, it affects the level of key neurotransmitters, builds cell membranes and controls the transmission of nerve impulses. It can also suport the weight loss. It does this by improving the sensitivity of tissues to insulin. In other words, it can be said that the low insulin sensitivity means that glucose instead of being used as a source of the energy is deposited in the form of adipose tissue. Inositol will be particularly effective for people with this problem. What is more, inositol improves the mood by increasing serotonin levels. Thanks to this, it is easier to control your appetite, especially for people who are prone to ‘eating’ under the stressful circumstances or comforting themselves with food when they are sad. Methionine is one of the endogenous amino acids. In supplementation aimed at reducing the body fat, it is often combined with inositol and choline. Together, they form a powerful lipotropic formula, which works on using fat in the body effectively. In addition, methionine supports the liver function, and as you know, without the proper functioning of this organ, it is difficult to maintain the proper body mass. Thanks to the fact that methionine is involved in creatine synthesis, it can also increase the muscle performance and improve the energy management. The herbal mixture consists of several vegetable diuretics. It includes: bearberry, agathosma betulina, couch grass, corn stigmas, hydrangea root extract and juniper berries. The same group may include the parsley which is present in the composition of the supplement. All mentioned plants have a strong diuretic effect. They allow to eliminate the excess water from the body, including the subcutaneous one, which spoils the definition of the figure and does not allow to fully expose the developed musculature. In addition, they show a number of health-promoting properties, they are powerful antioxidants, eliminate inflammation, especially in the urinary tract and have antibacterial properties. Potassium is one of the most important electrolytes. It is responsible for maintaining the water balance and acid-base homeostasis of the organism, in addition, it takes part in the transformation of glucose into glycogen and determines the work of muscles. People who use the diuretics are particularly exposed to their loss and, as a consequence, health-threatening electrolyte imbalance. Fortunately, the manufacturer took care of that and included, apart from the substances that show diuretic properties, the optimal dose of potassium in the composition of the supplement. B6 Vitamin is a water-soluble substance, which belongs to a large group of B vitamins. It is widely recognized as a substance promoting the slimming, which is why it is often included in the supplementation plans of people who aim at losing weight. In the body, this vitamin acts as a cofactor for enzymes involved in the metabolism of lipids, amino acids and carbohydrates. At the same time, it is important for the proper functioning of the thyroid – an organ which is responsible for the rate of metabolism. Finally, it has a gentle diuretic effect, therefore it allows you to get rid of the excess water from the system. Flax seeds provide the body with the valuable fatty acids, which are of great importance in the prevention of cardiovascular diseases. In addition, rodent studies have shown that linseed oil present in them can reduce the size of fat cells in obese animals. In addition, it limits the amount of pro-inflammatory compounds in adipose tissue, which is also an important factor leading to the weight loss. Consumption of flax seed can also, to some extent, improve the sensitivity of tissues to insulin and alleviate the symptoms of insulin resistance. Chlorophyll is an organic chemical compound that gives plants a characteristic green color. It is a powerful detoxifier, it improves the detoxification of the body and reduces the harmfulness of many substances hazardous to health (including aflatoxins and amines found in food). Pilot studies give reasons to include it in the slimming treatments. People who took chlorophyll for 12 weeks lost more weight than those who received a placebo. What is more, they also felt less eager for eating unhealthy fast-food. In conclusion, USA Sport Labs Cutting Edge is a highly effective burner, devoid of the stimulants and substances indifferent to health. The supplement is ideally suited for people who have a problem with stabilizing the blood pressure, or want to take a break from using the stimulants in order to ‘clean’ the receptors. The preparation will also be a good choice for people who tend to over-retain water in the body and struggle with the problem of edema. Fajnie przyspiesza metabolizm, wyrzuca zbędną wodę. Ciekawostką jest jedynie skład a właściwie ilości. Tabletka waży 2g a substancje w niej zawarte według tabeli ponad 3g. Bardzo fajny spalacz, jest to jeden z nielicznych spalaczy które faktycznie pomaga spalać tkankę tłuszczową i nie powoduje podniesienia ciśnienia. Take 3 to 6 tablets daily before excercises. Take 3 to 6 tablets daily with meals. The product works best in combination with physical exercise, but it will also work well for people who are not physically active. According to the manufacturer's recommendation, you should take from 3 to 6 tablets a day. The dose should be divided into two portions and taken within a few hours break. The optimal time to take the supplement on training days is the period immediately before the physical exertion. On days off from the training, the supplement can be taken at any time. The composition of the preparation is free from stimulants, so it can be taken even in the late evening without worries. Due to the presence of diuretics in the product, the amount of consumed water should be increased during the supplementation, in order not to lead to dehydration or disturbances in the electrolyte economy. USA SPORTS LABS supplements are a very good choice for people who do power sports. In the product range there are products like high-quality protein supplements, which is beneficially for the condition of muscles and effective fat burners. Worth noting is also a creatine of this, which provides a rapid restoration of ATP. Tablets with conjugated linoleic acid. They help to burn fat and improve your overall health. Uva Ursi (Arctostaphylos uva-ursi), of which a raw material is medical leaf (Folium Uvae-ursi), which is a rich source of active substances: flavonoids, phenolic glycosides, tannins, organic acids, mucus, triterpenes and resins. An important component is arbutin, having a diuretic effect (allowing for the removal of excess fluid out of the body), and anti-bacteria, against bacteria that cause urinary tract infections. It also acts as an astringent, stopping bleeding from damaged blood vessels. In the sports supplementation it is used due to the diuretic potential, it is used in programs to improve the aesthetics of the body and the composition and in certaincweight loss thermogenic supplements, available at www.muscle-zone.pl. Note: In Poland, bearberry is under partial protection. A cautious use is also recommended and time limits for use, as there may be side effects (symptoms of hydroquinone poisoning- nausea, stomach irritation, anaemia). Dosage depends on the quality and concentration of raw materials, note the comment regarding the duration of use and dose. Buchu - Bukko birch (Agathosma betulina) - a plant derived from the mountainous areas of South Africa, buchu leaves are diuretic and anti-inflammatory (remove excess water accumulated in the body and help to remove the toxins). Their essential oils have been used as additives for flavoring teas and alcohol. Buchu leaves are a component of thermogenic, slimming and detoxifying supplements. Doggrass (Elymus repens) - quackgrass (Agropyron regens), plant poales. Couch grass rhizome (Rhizoma Agropyri) is the source of medical material. It has a number of bioactive components, sugars (fructose, mannitol), inositol, organic acids, essential oil (kapilen, carvone), organic acids, mineral salts (including silica water soluble), vitamin C. Its name is taken from the observations of patients dogs that often dig out and eat the plants rhizome It works diuretic, laxative, detoxificating, antidiabetic, stimulates metabolism. In the sports supplementation it used to remove the subcutaneous water the outside of the body, which improves posture and weight reduction at a fairly rapid time and is important in professional sports played in different weight categories. Rare as the ingredient of weight loss supplements.